Shop online for over 800 microscale model trains at discounts up to 34%. Railroad Scenery is the most popular of the 5 microscale model trains categories, then Railroad Books and Accessories, and Scratch Supplies. This is the Alphabets & Numbers Railroad Gothic White Model Railroad Decal in HO Scale by Microscale. This is the Alphabets & Numbers Railroad Roman White Model Railroad Decal in HO Scale by Microscale. 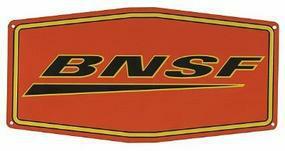 This is the Embossed Die-Cut Metal Sign - Burlington Northern & Santa Fe (Swoosh Logo) from Microscale Inc. This is the Alphabets & Numbers Railroad Gothic Red Model Railroad Decal in HO Scale by Microscale. This is the Mini-Cal All Vehicles Tanks, Jeeps, etc. (1940s+) Model Railroad Decal in HO Scale by Microscale. 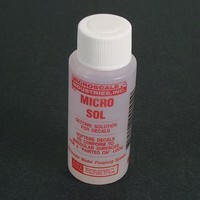 This is the Micro Liquid Decal Film 1oz Model Railroad Decals by Microscale. This is the Embossed Die-Cut Metal Sign - Denver & Rio Grande Western from Microscale Inc. This is the Micro Metal Foil Adhesive 1oz Model Railroad Decals by Microscale. This is the Alphabets & Numbers Railroad Gothic Blue Model Railroad Decal in HO Scale by Microscale. 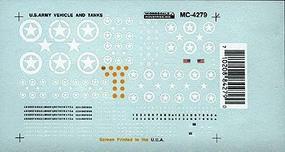 This is the American 50-Star Flags Decals Model Railroad Decal in HO Scale by Microscale. This is the Alphabets & Numbers Railroad Gothic Black Model Railroad Decal in HO Scale by Microscale. This is the Railroad Various Rivets Model Railroad Decal in HO Scale by Microscale. This is the Railroad Roman Letters & Numbers 10", 14", 18" & 20" White Model Railroad Decal in HO Scale by Microscale. This is the Embossed Die-Cut Metal Sign - Union Pacific from Microscale Inc. This is the Embossed Die-Cut Metal Sign - Northwestern Pacific from Microscale Inc. This is the US Vehicle Decals Tanks, Jeeps, Trucks etc. (1940s+) Model Railroad Decal in N Scale by Microscale.